The great mansion called Inisfada, located on Long Island's Gold Coast at Manhasset is being offered for sale at $49 million. 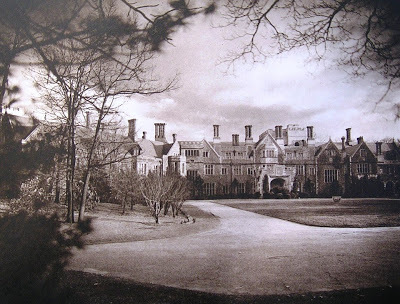 The future of this once magnificent mansion and remaining estate is uncertain. Is this to be one of the next" Lost Mansions of the Gilded Age" ? Inisfada at Manhasset, New York. Click HERE to see photos of the house when it was new. Is the reason of uncertainty due to the fact that it is being listed? Or, is this due to the price being at a point where only a few individuals and institutions may be interested? I understand the Jesuits are in negotiations with a foreign investor to develop the property into housing, with the mansion use in question. It is either going to be demolished or gutted for a condo conversion.